On 3 August 2016, 7km above Alaska's Aleutian Islands, a research plane captured something mysterious: An atmospheric aerosol particle enriched with the kind of uranium used in nuclear fuel and bombs. 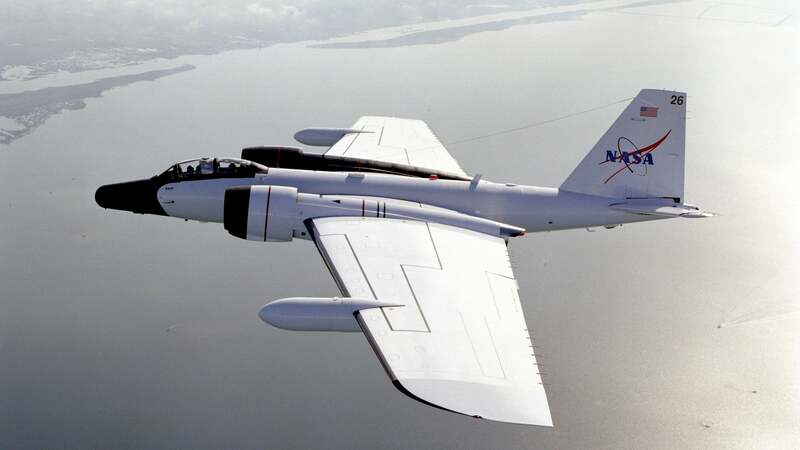 A NASA WB-57 plane, like the one that located the mystery particle. It's the first time scientists have detected such a particle just floating along in the atmosphere in 20 years of plane-based observations. Uranium is the heaviest element to occur naturally on Earth's surface in an appreciable amount. Normally it occurs as the slightly radioactive isotope uranium-238, but some amount of uranium-235, the kind humans make bombs and fuel out of, occurs in nature. Uranium-238 is already rare to find floating above the Earth in the atmosphere. But scientists have never before spotted enriched uranium, a sample uranium containing uranium-235, in millions of research plane-captured atmospheric particles. "One of the main motivations of this paper is to see if somebody who knows more about uranium than any of us would understand the source of the particle," scientist Dan Murphy from NOAA told me. After all, "aerosol particles containing uranium enriched in uranium-235 are definitely not from a natural source," he writes in the paper, published recently in the Journal of Environmental Radioactivity. Murphy has led flights around the world sampling the atmosphere for aerosols. These tiny particles can come from polution, dust, fires and other sources, and can influence things such as cloud formation and the weather. The researchers spotted the mystery particle on a flight over Alaska using their "Particle Analysis by Laser Mass Spectrometry" instrument. They considered that perhaps the signature came from something weird, but evidence seems to point directly at enriched uranium. They were not intending to look for radioactive elements. "The purpose of the field campaign was to obtain some of the first global cross-sections of the concentration of trace gases and of dust, smoke, and other particles in the remote troposphere over the Pacific and Atlantic Oceans," according to the paper. But where the particle came from is a mystery. It's pretty clear it came from recently made reactor-grade uranium, the authors write (AKA, not from Fukushima or Chernobyl). Perhaps from burnt fuel contaminated with uranium, they thought. They tried to trace it to a source using the direction of the wind - but their best estimate pointed vaguely to Asia. Higher probability areas include some parts of China, including its border with North Korea, and parts of Japan. You don't need to worry about atmospheric radiation from just one particle, though. "It's not a significant amount of radioactive debris by itself," Murphy said. "But it's the implication that there's some very small source of uranium that we don't understand." One author, Thomas Ryerson from NOAA, told me that he needs other scientists' help. "We're hoping that someone in a field that's not intimately associated with atmospheric chemistry can say 'a-ha!' and give us a call."